My mantra along my path into birth work has been "let it happen." Birth work sought me out, wouldn't let me fight it off, and has thrown things in my lap along the way--beautiful, crazy, unbelievable things! I have been humbled beyond belief throughout the past five years with amazing opportunities, experiences, and the immense honor of witnessing such vulnerable experiences with the beautiful families I have served. As my formal midwifery training draws to a close, I asked the universe to just "let it happen" and tell me the direction my work should head in next. I never knew that the plan would not only make itself known, but then begin to happen right before my eyes. Suddenly I found myself in a whirlwind of plans, thoughts, and dreams coming to fruition....and in the middle of all of that, a newly retired Blood Mobile fell into my lap. Not literally, of course--by "fell" I mean after lots of tough bargaining, pleading, and maybe a few tears, I acquired it. I was a woman with a dream, a plan, and a 40ft Blood Mobile in the yard. Let me take a few steps backwards and explain to you WHY I needed this monster. When I began midwifery school, my pie-in-the-sky dream was to have a mobile easy-access clinic to provide prenatal care to low income and at-risk families. We have so many women who want and NEED quality midwifery care but face barriers with transportation and accessibility to that care. Not far from where you and I live, there are communities where women are TWICE as likely to die during pregnancy or childbirth than their more affluent counterparts. Let that sink in for a moment. TWICE AS LIKELY. In these same communities, their babies chance of survival past the first year is just as grim. To me, it seemed the easiest way to begin the pendulum shift in the other direction was to put myself right in the middle of where the statistics were coming from. I knew I needed to make the quality care a midwife provides accessible to the families that need it and deserve it! I spent lots of time combing through high-end RV and specialty vehicle websites, pricing out THE ULTIMATE maternity mobile. We're talking Florida-Blood-Services-Eat-Your-Heart-Out-Mobiles. These specialty units can cost anywhere between $250,000 and 1 million dollars. Ah yes, the maternity mobile that would never be from even my most hopeful future midwife salary! When I saw the price tags, I shelved my idea to a Pinterest board and got on with my life thinking that someday (see also: probably never) I could do that. Fast forward a few years back to that bus in my lap. The Blood Mobile that had found its way into my life, while perfect in every way, was still a Blood Mobile. Equipped only to drain you of your life juice for a lousy rice krispie treat and a hideous visor that (lets be honest) you'd never wear. It ran, everything worked, but it wasn't what I needed. Through some beautiful and unbelievable serendipity, I found the amazing Jeff and Kelly Halldorson. 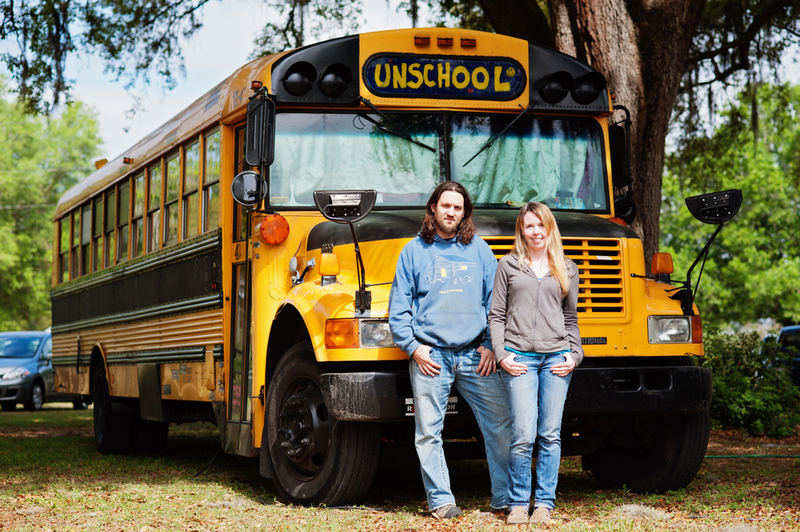 Jeff and Kelly spend their life with their teenagers traveling across the country sharing their Unschooling ideas and learning from the land. Due to some unfortunate circumstances, Kelly and Jeff had to cancel their spring work they had laid out on the West Coast and return home to New England. Those circumstances, while devastating, created a unique opportunity for me to slip in as part of their touring adventures for a project. On a whim, a previous client got me in touch with them, and after a flurry of emails and text messages they were on their way to the Deep South to help me remodel the bus. They were inspired by our desire to help families birth their own way, to reach out to our community. We are so grateful for the time they spent here in Florida with us, sharing their stories and life while making such beautiful and positive changes in ours. Jeff is a jack-of-all-trades. No job is too big or small, and I am now convinced there is nothing he cannot do. Kelly was sure to keep Jeff's coffee cup full and things in order while they were here. I was so impressed with their family dynamic and the love they put into everything they do. When I first sat down with Jeff to come up with a plan, I explained my vision, my (tiny) budget, and left the rest up to his experienced imagination. This is what he does and I didn't want to hinder his process. That was one of the best decisions I could have ever made! Jeff came up with blue prints, a timeline, and a plan of action. After gutting the entire back end of the bus, he began adding a bathroom and a private exam room where the actual blood donation chairs were. Extra care was taken to provide me with ample space to see clients in the exam room without feeling cramped or like you were even on a bus. This was Jeff's forte I think--I mean, there are 5 full-sized humans living their life every day on their bus, and doing so pretty comfortably! 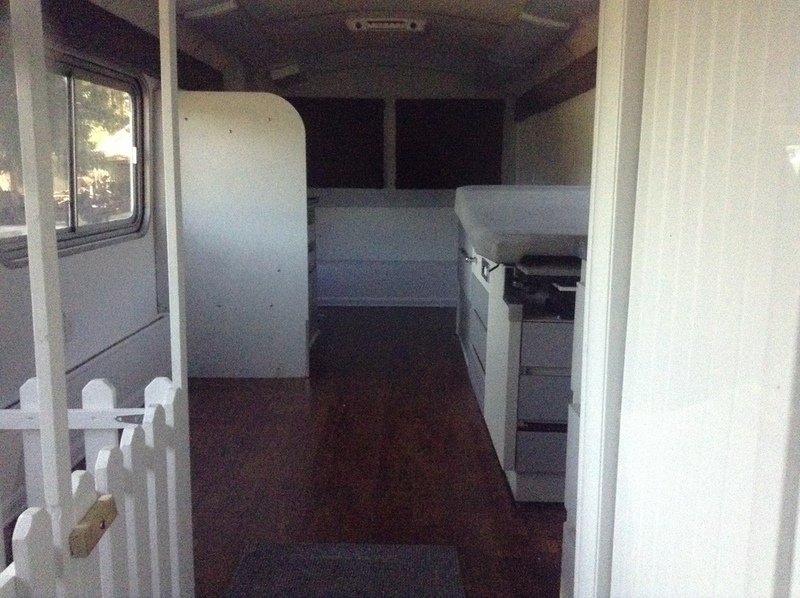 The entire back of the bus is now a beautiful and fully functional exam room, complete with bench seating, a hot water sink, and even an adorable kids play area. Jeff also turned one of the old interview rooms into a perfect little bathroom (with a perfect little sink! ), and added in extra storage for supplies. He also completely repainted the exterior of the bus to a blank industrial white so it didn't scream BLOOD SERVICES at us anymore. His work was thoughtful, intentional, and purposeful. The (almost) finished product is some of the best craftsmanship that I have seen come out of ONE person's hard work. Back of the exam room after remodel. I was blessed with generous donations from two really supportive people in my life and the scraping up of all of our savings to make the first leg of this dream happen. I was able to purchase the bus and compensate Jeff & Kelly for their time and tremendous effort. I am forever indebted to them for doing so many amazing things on such a shoestring budget. So now the finished bus sits, waiting for the final touches to make it a living, breathing part of the community. It must be stocked with supplies, and the interior furnished before we are able to see clients. I am also looking forward to having the outside of the bus covered with our mission and our name...and maybe even some gorgeous photos of previous clients. I am taking my exam in August to become a Certified Professional Midwife, and upon my passing will become a Florida Licensed Midwife. Once my licensure process is complete we will begin taking the bus out into the community 1-2 days per week to see women for prenatal visits. We are hoping to connect with our local Healthy Start Coalition, local churches, and public women's health services to make them aware of where the bus will be situated for visits each week and how they may go about referring people for care. Women will be able to access information on women's health, pregnancy, early childhood health, find assistance with applying for Medicaid if needed, and of course be seen for prenatal and/or postpartum care. No births will take place on the bus. 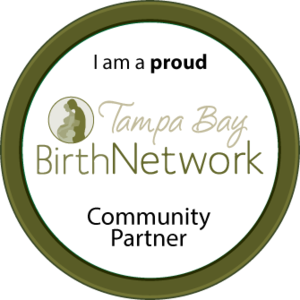 We will continue to serve women who are good candidates for homebirth, but provide women who desire a hospital birth with excellent prenatal care and a doula to accompany them to the hospital. They would then see the on-call physician or nurse midwife at the hospital of their choice- the same way they might if they were to receive care at a public clinic or health department. Let's make this possible for EVERY family. This is the ultimate goal of the Barefoot Bus! This is the vision that is coming to life before our eyes. There is only one problem, and I am sure you can guess what that is: Funding. In order to make such a large scale community project come to life we have to have supporters. We still need one final pull to make the bus operational--normal maintenance, the stocking of supplies, and the finishing touches. We are coming to you to share who we are, what our story is, and how you can help us make this dream a reality. Did you have the awesome care of a midwife during your pregnancy? A great outcome because of it? Help share that with another family! Help us reach hundreds of families and start the pendulum of birth care swinging in the more positive direction. We have started a funding campaign over at Indiegogo with lots of awesome incentives for our supporters. We're giving away everything from funny bumper stickers, in-home massages, all the way to adding your company's logo to the bus to be seen all across Tampa Bay! Our funding goal is $10,000--with every bit of that going into the bus. We are setting our sights high, and hoping that you can help make this very important vision come to life. Even if you cannot donate, we appreciate you spreading the word about this project with your friends, family, colleagues, and clients! Feel free to contact us with any questions you have--we are all so excited to share our vision with you! 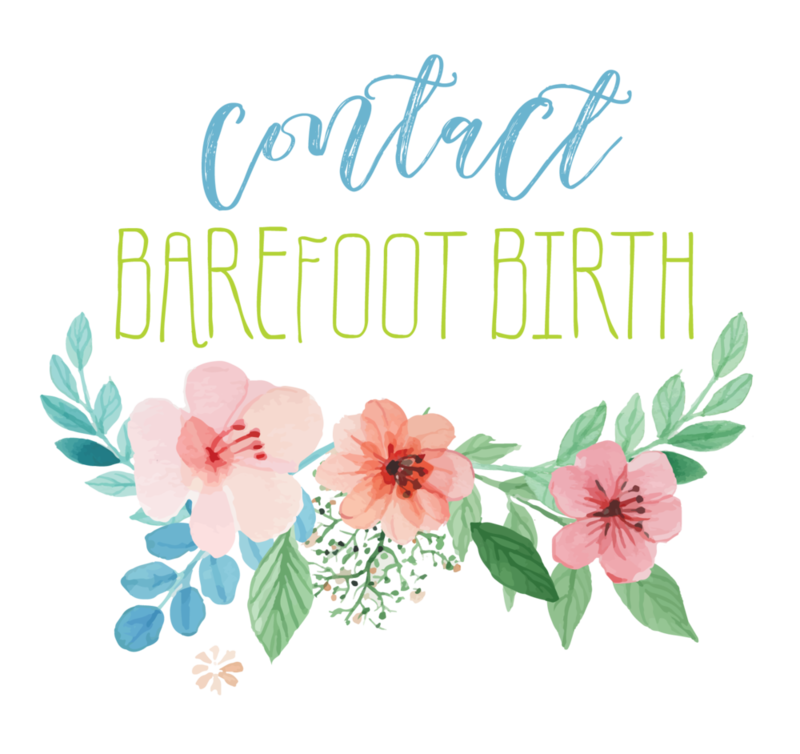 Help our Barefoot Birth Family help more families in YOUR community. Are you with us? Get on the bus, y'all!